Hello and welcome to day one of the Diamond Traditions Book Tour. 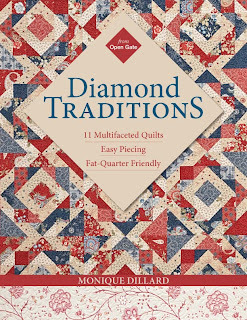 Diamond Traditions is the latest book by Monique Dillard of Open Gate Quilts published by C&T Publishing. This is Monique's 3rd book, following Fat Quarter Winners and Fat Quarter Quilts. This book is also a fat quarter friendly book. As with Monique's first two books, this book has beautiful color pictures of all the quilts and quilt blocks, wonderfully illustrated instructions, and charts to help you make all the projects in an assortment of sizes. 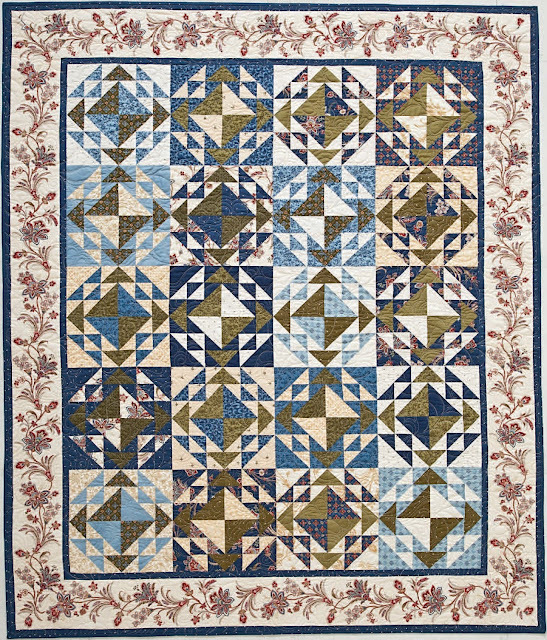 Diamond Traditions has patterns for 11 different quilts. I was fortunate enough to get to piece a quilt for the book, I pieced Ocean Diamonds. This is the first time I've had a quilt show up in a book, it's a fun experience for me. I pieced this quilt way back in June of last year but could not blog about it until now. It finished at 62" X 74"
Its has approximately 972 pieces. 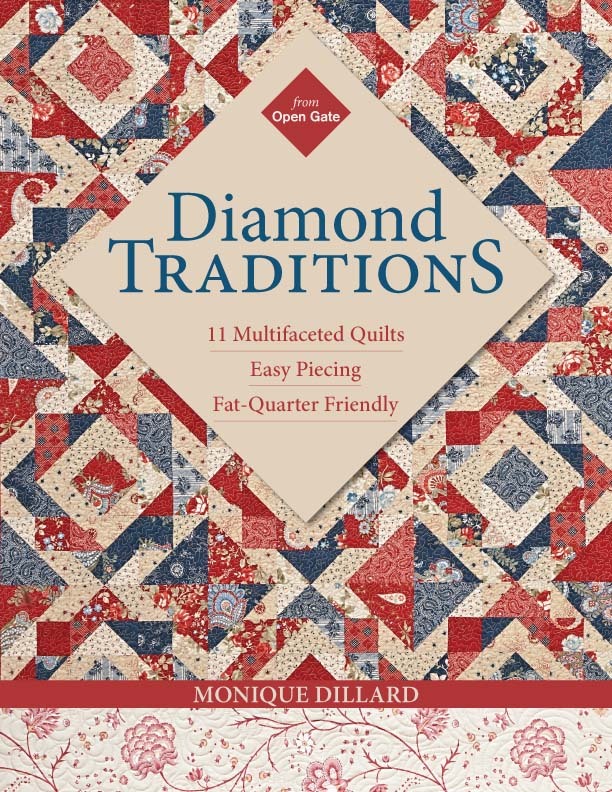 Diamond Traditions is available in quilt shops and online. Comparing the cost of one pattern to the 11 patterns provided in this book make this book a real deal! If you enjoyed Monique's first two books I know you'll love this book also. As part of the book tour, each blogger is going to answer the following questions, I hope you enjoy getting to know us a little better. What was my first project - Lifetime Quilt Number 1 - Click here to read all about it. Favorite Movie - I love movies, so this is hard for me, but I've watched "You've Got Mail" more times than I can count, so I guess I will have to go with it! Favorite Book - I love to read, so this is hard for me too, but I really enjoy books that make me think about them days after I finish them, and I love all types of books, biographies, mysteries, fiction, non fiction. But if I have to pick one book I'll go with "My Losing Season" by Pat Conroy. Favorite TV Show - I love those bridal gown shows on TLC on Friday nights. I don't care if it's "Say Yes to the Dress", "Say Yes to the Dress Atlanta", or "I found the Gown". If it's Friday night, I'm watching somebody pick out a wedding gown. Where I grew up - I grew up in a small town in the midwest. All of my family still lives there, I was the only one who flew the coop. Dog or Cat - Not even close, this family is a dog family. Although I'm allergic to cats so I've never been able to get to be around them. Hobby if I didn't quilt - If I didn't quilt I know I would have some sort of hobby, I'm not one to sit around and just watch TV, I would probably select golfing. Quilting is a lot like golf, both hobbies are very time consuming, require expensive equipment, and practice if you want to be good. Sports - participant or spectator. I love sports, my favorite sport by far is football, which requires me to be a spectator, but I also enjoy other spectator and participant sports. Least favorite part of quilting - Picking out the fabric! It's not very often that I finish a quilt and don't think, "I should have used different fabric" or "I want to make that again in different fabric". Most favorite part of quilting - The math! I love checking all the math in every pattern I make and even redo the math on most patterns I buy. It's like a game to me and relaxing. Biggest quilting inspiration. I would have to say my quilts became more interesting and I became a better quilter when I started participating in Sinta and Sherri's Schnibbles quilt along. Those little patterns let me be more creative with fabric, experiment with block sizes, and sometimes, change up the whole thing. The things I've learned making those Schnibbles has seeped into all my projects. Sweet or Salty - Sweet! This is going to be a week of fun and giveaways, please visit these bloggers to see their projects and for more chances to win Monique's latest book. Giveaway now closed, thanks for stopping by. Favorite book - China Court by Rumer Godden. Thanks. oh I love this quilt you made no. 83 the colors are "talking" to me!!!! looks like a great book! I love her rulers!!!! ok no.12 biggest quilt inspiration? ANTIQUE QUILTS! and Gwen Marston when I first read her book about Mary Schaffer I was hooked on reproducing antique quilts and buying more and more of Gwen's books over the years has taught me a lot. I am so glad that I got to "meet you"! And I will be back. I love Monique's style so am anxious to see the book...and use it! My favorite television show is Person of Interest. It is the only one that I cannot miss otherwise television is not a priority. Have a wonderful week! #6 I too grew up in the Midwest (Iowa) and am the only one of 5 that flew the coop. 4 States later I settled in Ohio to be by my daughter and grandkids. Thanks for sharing both your fabulous piecing skills but also about yourself. That is a great quilt. Beautiful colors. I love Monique's books. We are a dog family. Three beautiful Miniature Schnauzers. It's nice getting to know you better. One question that I'll share is that my most favorite movie is Sweet Magnolias OR Fried Green Tomatoes, see I can't pick out just one. I would love to be a winner ! No. 13--Salty or sweet ? Both- together !!! Nice giveaway! In answer to one of your questions, I will say that unfortunately I'm Sweet AND Salty, which can be a problem. What a beautiful quilt!! And what a treat to see it in print! While we have both in our household, I am a dog person. Hennessy is the Great Dane that shares our house and I can't imagine not having her in our lives. Love the quilt and hope to add this book to my collection sometime. Salty no question, unfortunately with HBP I am supposed to be restricting this. Quilting keeps the hands out of the chip bags. I also grew up in the Midwest, but near a small town, and I'm still here! I've been quilting for about 20 years and my favorite part is the piecing. Your quilt is beautiful. If you picked out the fabrics for it you did a wonderful job even if you don't like that part. My favorite part about quilting is hand stitching the binding, because it is almost done! Congrats on the quilt, Thelma! I've just recently found my new favorite author and her name is Kate Morton. Ive read all four of her books this past year and my favorite is probably The Secret Keeper or House at Riverton. This girl must be really smart to tie her 100 year story lines together. Beautiful quilt! My first project was the Quilt in a Day, Irish Chain. I still love the Irish Chain look although I have made many other quilts since then. Love the quilt. My favorite tv show is Blue Bloods. Beautiful quilt, Thelma! You always do such nice work! My least favorite part of making a quilt is the borders. I enjoy the cutting and piecing but by the time the quilt is ready for borders, I'm ready to be done! Once I get those on, I'm home-free! The quilt is lovely with such a perfect border! Enjoyed reading your answers...You've Got Mail is one of my favorite movies too! Thanks for the chance to win Monique's book. I grew up on a farm outside a small town in Illinois--small family, few cousins; almost everyone lives elsewhere now. What a great quilt and fabric and how exciting to have your quilt in the book! I have Monique's other books and love them. I grew up in a very small town in the Midwest and like you I flew the coop. DH and I lived on the East Coast for many years. Several years ago DH & I moved back to the Midwest. I love your quilt. Thanks so much for sharing with us. I grew up in Arkansas and have returned after 35 years. Wow things really changed while I was gone. :). I love to read your blog! Can't wait to see the Coastal Lily finish! My favorite part of quilting is changing up a pattern to make it a little different. Just changing the color, the block sizes or the border is enough to make it my own! Thanks for the chance to win! My favorite part of quilting is the designing! I love the challenge of limited fabric choices, finding an appropriate pattern, figuring the math...I do this for our church quilts all the time. I have a couple of people who love to just sew...give them the cut fabric and instructions and there they go! Not me, I like the designing! It just floored me that you have only been quilting since 2005! I have been quilting much longer and haven't even come close to making as many as you. Well done!! My favorite movie is P.S. I love you. I'll be checking out your favorite too. Well done Thelma! Congratulations on having your quilt piecing published in Monique's book. It sounds like another winning book. My favourite movie has to be Out Of Africa. I own it and must have watched it at least a half dozen times or more, and On Golden Pond runs a close second. Ocean of Diamonds is a lovely quilt, Thelma! How exciting that it's in Monique Dillard's new book! It will be the first one I look for if I'm the lucky winner. Judging by the amount of fabric I've acquired over the last few years, I'd have to say my favorite part of quilting is petting fabric! If all the quilts are spectacular as the one you made, it is a must have book. #12. Antique quilts are my inspiration. Thanks for letting us get to know you better. The hardest part of quilting for me is picking out the fabric. That seems to take forever. I still need a lot of practice with getting the right balance of tones and patterns, color value, etc. I am proud to be a true Georgia Peach! Love reading your post. Thanks for the chance to win. I like that the book is FQ friendly. Cat or dog? We are a doggy family. In fact there are five little canines, all strays, so that's 20 little feet to dry after a walk on a cold wet Melbourne morning. Thanks for the great giveaway chance. My least favorite part of quilting is layering the sandwich. Ugg! Thansk for the giveaway! My youngest niece was a consultant in the Nashville "Say Yes to the Dress" show. She was Bunny. I don't think she made it on TV. My guess is that she was on the cutting room floor. She had fun doing that shoot. I love to read! I read magazines, quilt books, cookbooks, and I love a good mystery, romance, and spy novel. Right now I'm listening to a spy novel and reading some quilt-related fiction. I buy FQs and 1/2 yard cuts, so this book would be quite stash-friendly for me. Thanks for the opportunity! My favorite book and movie, "Gone With The Wind". Thanks for the give away! I think we are secretly twins who were separated at birth. I have been a blog reader for a long time, and it seems to me that our tastes in most everything are eerily similar. I like your Ocean of Diamonds! My favorite part of quilting is piecing the top but I have trouble choosing borders! And I hate the math but I have worked with numbers all my life. Your quilt is great! It's always fun to see your work in print! I made my first quilt in 1972. Wow! That sounds like a long time ago now. I also love math but I love to pick out the fabric. Especially with 'scrap' quilts (although there's nothing scrappy about a pile of new fabric! ), I get to use anything I want in the quilt. HI! MY FIRST PROJECT WAS A SMALL QUILTED DOLL QUILT OF SQUARES AND I WAS HOOKED! THANKS FOR SHARING! My first quilt was a baby quilt that I pieced and quilted by hand. It took 3 months for me to finish in 2008. Your quilt is very pretty and the book looks great. Thanks for the chance to win a copy. Hi - Ocean of Diamonds is beautiful - love the colors! #8 - For my other hobby I would choose cooking - I like to experiment and it's my go-to activity if I am 'stuck' in a quilting project. I too am a dog person ........... I love,love,love all of your quilts you are so talented. Thelma--I've been inspired by reading your blog! My question to answer-- # 8: Hobby if I didn't quilt would be gardening for the same reasons you list. Time consuming, expensive but totally enjoyable. Any creative activity is good for the soul. Thanks for the opportunity to win Monique's book. What a fun post! I love your quilt!! My first quilt was a twin size for our oldest son when he graduated to his 'big bed'. It was way more than a beginner should have taken on and I sure learned a lot along the way. :-) Thanks for the chance! I'm looking forward to seeing Monique's new book. My first quilt was a gift for a friend's baby boy who was born 3 days before my second son. I decided to make a quilt for him on the day he was born (a month early) and finished it before my son was born. My first quilt deadline! I loved this post and loved getting to know you better! I LOVE this quilt and especially the border. That is the greatest border fabric I think I've ever laid eyes on! I'm a sucker for a border print! I'd have to say my favorite movie is You've Got Mail also - can't count how many times I've watched it. As for another hobby - I'm a golfer and you're so right that it takes practice. My game has been shot since having kids - no time to go! And BTW can't believe you're favorite part is the math! I'll have to send my math questions to you from now on!!! These days I seem to always follow sweet with salty or vice versa. It was fun to learn more about you. I already knew that you were an amazing quilter. Love your bog and your projects. Congratulations on making the book. No wonder, it is a beautiful quilt. My favorite part of the quilting process is putting on the binding. That means I have a finish and can start a new one! Thanks for the chance to win this book. You asked for us to answer one of your questions and I'll answer the favorite movie. That movie is Major League. It makes me laugh just about every time I see it. Thanks for sharing. #7. Dogs, of course! I love the quilt you made for the book - gorgeous! I started quilting in the 1980s. I love movies and books. My favorite movie of the moment is Perks of Being a Wallflower; my favorite book is Rebbecca by Daphne DuMaurier. And I am definitely a dog person... a doxie person. Thanks for the chance to win a copy of this book. Monique's new book looks like a winner, and your quilt is gorgeous! I have lived in Utah all my life and love it! My favorite book is East of Eden, favorite movie is Les Miserable, the movie. Favorite part of making quilts is piecing the blocks; least favorite is sewing all the rows together. Yuck! Question 10. Least favorite part of quilting is binding. I really hate it. Don't know why. It really isn't all that hard, I just find it to be boring. Thanks for the chance to win this great book. Well, I must say this was a fun and newsy post!! Always good to get know the favorite people you follow. My least favoritie is probably also selecting the fabric, that's why I like buying fat quarter bundles and looks like Monique's book makes that part a cinch!!! I'm definitely a dog person, however I lie little dogs. After havign a German Shepherd, who was such a sweetie - I could hardly get her in the van when she got old and ill - and now that I'm older, it is worse. We lost our dog after having 7 maltese a few years ago, and I'm still not over it! We do however have a stray cat that hangs out around the house outside, and we had her spayed and feed her. I'm originally from Virginia, one of the most beautiful states, that has it all - mountains, beach and can grow anything with 4 seasons!! My favorite part of quilting is when it's done and basted and I can finally start hand quilting. Least favorite part? Pinning and basting it. It is a mystery to me how you managed to keep #83 a secret during your countdown to 100. Good job on the quilt, it is a beauty! Beautiful quilt, I hear the back is just as pretty. I need the book to see! I love your quilts. Everyone beautiful but my favorite is the Red and White triibute to the red and white quilt show. I enjoyed reading the questions about you and quilting. We are dog people all the way too. Thanks for the chance to win this book. I have a hard time picking out the fabric that is why you are more likely to find me buying a kit. Ocean Diamonds is an amazing looking quilt. How exciting it must be to have made a quilt for Monique's book! The easiest question for me... I'm a cat person. Three of them have me well trained! My introduction to quilting was in1976 when the 6th grade class at my elementary school made a quilt to celebrate the Bicentennial! I designed and appliquéd a block with a cannon and cannon balls! But I really started about 25 years ago when I used to watch Quilt in a Day on PBS. Congratulations on piecing a quilt for Monique's book! Ocean Diamonds is beautiful! I started quilting in 1995 while living in Nashville, TN with my ex-husband. My first quilts were identical quilt for my two daughters. I couldn't make a quilt for one and not the other. My next project was identical quilts for my two sons. I love Ocean Diamonds! It is a beautiful quilt!! I would love to win this book! My first memories of quilting was watching my paternal grandmother hand piece blocks and then quilt the tops during the winter months. Grandma would make these quilts to keep us warm. Sometimes she would let me mark the quilting design by tracing around the cardboard template. I can't wait to get this new book! Congratulations on your first quilt featured in a book! What a milestone you have just crossed and what a lovely quilt you've made. I love it and would love to win the book so I too can have an Ocean Diamond quilt. Thanks for the chance to win and the inspiration. What a super looking book! My least favorite part of quilting is also picking the fabrics...that and "arrange in a random and pleasing manner"...HA! Thanks for the chance at your giveaway. Love your quilt! It was fun reading your answers, I definitely wouldn't have picked you as a wedding gown show watcher :). I love sweet and salty together, must be part of my OCD for having it all - like salted Carmel or candy coated pretzels yum! My favorite movie is "Finding Nemo"...so many great lines that my kids and I use on a regular basis! I'm doing Monique's Blogger Girl BOM right now and I've enjoyed it so much. I don't have any of her books so I'd love to have this one. My least favorite part of quilting is the actual quilting. I love to make the tops, but wrangling a big quilt under my home machine just makes my shoulders ache!! #12 - Greatest quilting inspiration? definitely visiting the US in 1976, when I saw people quilting as part of the Bicentennial celebrations that set me off looking for quilts here in the UK and then making them. I started quilting in August 2012, just under a year ago. I made a patchwork tablecloth using up some bits of fabric leftover from making bunting for my grandaughter's birthday party. I liked the experience so much that I haven't stopped. My biggest source of quilting inspiration is blogs. I am always amazed at how productive and creative quilt bloggers are. What a beautiful quilt! My least favorite part of quilting is pinning and basting! And I really struggle with choosing fabrics. I love looking at them, but when it comes to putting them together to actually make something?? Thanks for a chance to win! My first quilt that I made by myself was a Vogue pattern of Noah's Ark but I learned to quilt with a church group. One woman in the group knew how to quilt and taught the rest of us to make our very first charity quilt from the pattern "Sunshine and Shadow," all by hand. I really enjoy seeing the quilts you are working on. You are such an inspiration. I really want to make a red and white quilt. Thank you for being you! My favorite part of making a quilt is the quilting. I have a longarm and sometimes I make a particular quilt pattern just so I can quilt it. My least favorite task in quilting is pin basting. Boy, do I hate that! Thanks for telling us a little about yourself ,the book looks wonderful and I'd be thrilled to win. I grew up in a small town on Cape Breton Island in Nova Scotia . Thanks for the chance. Your Ocean Diamonds quilt is beautiful! My first patchwork project was a pillow from a Woman's Day or Family Circle magazine article. I was hooked from day one. Thanks for the giveaway! I love your site, go it most everyday. Congrats on being picked to do a quilt for the book, it is beautiful. My favorite movie is Gone With The Wind, have read the book 3 times. I started quilting 20 years ago and piece most everyday. Would love to win th book. I love your blog! Your precision and dedication is inspiring and I always love when you show photos of your quilts hanging in your neat and tidy home. I thoroughly enjoy watching your quilts grow - you are so organized and your work is wonderfuly. I started quilting in 1975. I was in a small cross stitch shop and a new fabric shop opened across the way. It was my first quilt shop and I signed up for a class that day! Love the quilt. My least favorite part of quilting is choosing fabrics. I like to stay with collections. Favourite book? Usually one of the last three I've read. I've recently stumbled onto the Walt Longmire mystery audiobooks. All I can say is don't read them with your eyes - read them with your ears! The narrator is superb. Cool blocks - certainly not a combination I would ever have thought of for this pattern! Love the book cover!! I'm in my red/white/blue phase right now!! Your quilt is stunning as usual. We are a blended family with 4 dogs and a 6 toed tom cat named Jesse James. Loved getting to know you better! It is amazing how much you've accomplished since 2005. I love your blue Ocean Diamonds. My first quilt was a log cabin quilt in a day...many years ago! I got a real chuckle reading your comments cause my favorite part of quilting is picking the fabrics and my least favorite part it the math! Thelma, I too grew up in a small town in the Midwest...Tipp City, Ohio. I was a math teacher before we started our family, so I too love all the math involved. Many of my friends call on me to do the math part of their quilting...and I am happy to oblige. Thanks for the giveaway....I wil be hopeful. Least favorite part of quilting: cutting the fabric! I love to sew the quilt pieces together, but really don't like all the time it takes to cut all the pieces. Thanks for the chance to win Monique's book! My favorite part of quilting is thinking about the Geometry of the blocks. My least favorite part of quilting is that I don't have enough time to quilt! I am a math (including Geometry) and science teacher and would love to just quilt all day. Retiring soon! My least favorite part of quilting is basting. I love blog tours! I get a chance to visit new to me blogs! This looks like a great book. I love the quilt you pieced. Cat or Dog-well I have 2 dogs and 3 cats in my house. I like them both. Pretty quilt! I am totally the opposite--choosing the fabrics is my favorite part and I hate math!! I have regretted some of my fabric choices though--but I've learned from those mistakes! I started quilting in 1981 as something to fill my time and mind as I became an empty nester. Have been quilting steadily ever since. I'm enjoying your blog, and reading over the comments by others. My favorite part of the process is - the binding! If I'm sewing on the binding, it means I'm almost done, can start enjoying my finished product or gift it, and can start planning my next project. Salty or Sweet - definitely sweet and it has to be chocolate! What is it about quilters and their chocolate? My favorite part of quilting is picking fabrics to begin! It's always so exciting to see it all come together. It gives me my decorating fix. Lovely quilt, Thelma. I always enjoy watching your progress and think you do pretty well at choosing fabric--especially if that's your least favorite! My least favorite is basting the quilt sandwich, which is why I often have mine professionally quilted. Most favorite is a toss-up between choosing fabric and piecing. Thanks for the giveaway! My first quilt project was a Christmas wallhanging that I saw pictured in a catalog many years ago. I didn't know anything about quilting but I just HAD to have it to decorate my house. So I ordered the pattern and made it. I still hang it every Christmas, imperfections and all. I think I agree with you about picking out fabric. I so much want to choose fabrics that go together well but are not in the same line. I'm working on that. I've only been quilting just over a year, so I know I've got a lot of room for growth. Thanks for sharing today! LEAST FAVORITE PART OF QUILTING IS THE ACTUALLY CUTTING (A SWELL REASON TO BUY PRE-CUTS!). THANKS FOR SHARING A GREAT GIVEAWAY! Thelma, your quilt is just gorgeous! I thought I'd share my quilt inspiration. My great grandma was a quilter - more of the double knit/anything goes into a quilt era. I laugh any time I gravitate towards bright colors. When I pick out fabric that's obnoxiously bright I can't help but think of grandma Edith and her creations. I enjoyed getting to know more about you. I just started quilting last October. I took a few classes at a nearby quilt shop. I am so surprised at myself: I absolutely love it. I love the fabric selection, the patterns, the piecing and the finished project. I feel addicted and am always thinking about the next quilt. I so enjoy it. I love reading about your blogs, the new books coming out, quilt market and the next season's fabric collections. It has been so much fun. Thank you for the chance to win the book. It looks great! Hi Thelma, I started quilting about 12 years ago but I've sewn for about 25years when I was a little girl. My favourite part is picking fabrics and least favourite part is hand sewing down the binding. I've learned how to machine bind! My favourite tv shows are NCIS, Bones, Greys Anatomy, Big Bang theory and an Australian renovation show called The Block. I love Moniques quilts and rulers. Love coming to your blog every so often, very interesting! Sweet& salty at the same time, mmmm. I just discovered your blog and have spent several hours over the past few days pouring over all your wonderful creations. So inspiring......your work is amazing! By far, my favorite part of quilting is picking out the fabric. I have the stash to prove it! I like watching people progressing on wonderful quilt projects on blogs. I am a dog lover and grandson 3 years old noticed my dog Maggie after her summer haircut-and said Maggie has "polkadots"!! with all her hair gone her true coloring showed thru. Has he been in too many quilt stores with grandma? Where I grew up - Ireland. WE moved a few times so no one town, and even though I no longer live there it will always behome for me. My least favorite part of quilting is binding. Favorite part is picking fabrics and planning. I would love your Ocean of Diamond Quilt and your choice of fabrics for the quilt. Please enter me into the contest to win the Diamond Tradition Quilt Book. I enjoy reading your blog and seeing what wonderful quilts you are making. I have a been collection fabric since 1973 when I started quilting. I love creating quilts and reading what others quilters are making too. Thanks again for blogging about your quilts. I started quilting 20 years ago when I made my first queen-size sampler. Thanks for the giveaway! I love the border on your quilt. The whole thing is very pretty. I think I will answer the question about my least favorite aspect of quilting. For me it is sewing on borders. I feel like I've been doing that so much lately, too. You think it is going to be easy and quick, but I measure and re-measure and carefully cut and once two sides are on, it starts all over with more measuring! Hi there. Great looking book. When did I start quilting? 1980. I was pregnant with child number 3 and took a night school course. I missed the last two classes because she came early. How exciting to have a quilt in a book--and it's lovely! (Like everything you do!) Looks like a fun book to have--I'll have to watch for it!